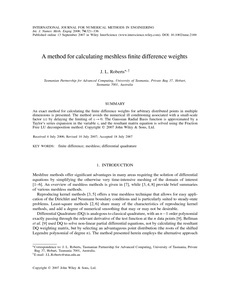 An exact method for calculating the finite difference weights for arbitrary distributed points in multiple dimensions is presented. The method avoids the numerical ill conditioning associated with a small-scale factor () by delaying the limiting of 0. The Gaussian Radial Basis function is approximated by a Taylor's series expansion in the variable , and the resultant matrix equation is solved using the Fraction Free LU decomposition method.